Want to connect with Nayla? 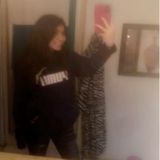 Im sixteen , my full name is nayla rochelle martinez. I do babysit my 3 bothers and sometimes my cousins afterschool. I love kids and i would highly look foward to babysitting your kids . I am 4´9 so im short. Im currently learning how to drive , going to take drivers ed this summer. I would highly reccommend you emailing me @....martinez13@gmail because i tend to check my email everyday. I did take a child development class my freshman year .